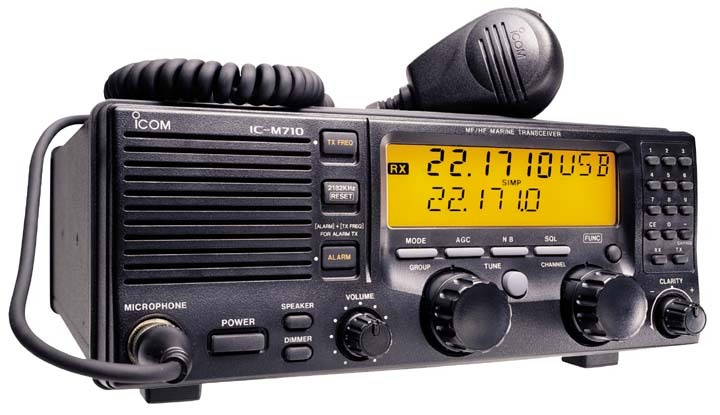 ICOM's next generation commercial grade SSB. Simple, dependable worldwide communications at an affordable price. Receives Ham broadcasts. 1136 channels. 160 user-programmable, 242 ITU SSB duplex, 72 ITU SSB simplex and 662 ITU FSK duplex channels are available. The highest quality components are used throughout. Constructed in a die-cast aluminum chassis with surface mount components, the IC-M710 is designed for long hours of operation in the harsh marine environment. The large, easy-to-read display shows status at a glance. Seven characters can be programmed into each memory channel to conveniently display station manes, ship names, etc. A full 150 W (PEP) of output power is available for reliable long distance communication. A large cooling fan, in combination with the aluminum chassis, allows continuous transmission at full output power - even during demanding RTTY (radio teletype) and NBDP (narrow band direct printing) operation. An automatic tuning function is available when using the IC-M710 in combination with the optional AT-130/E (required - sold separately) for quick and easy antenna tuning. Tuning is fully automatic. When you push the PTT on a new frequency, the antenna tuner quickly tunes the antenna automatically. Two large memory and frequency dials allow quick and easy operation. Dimensions: 11-15/32'' W x 4-19/32'' H x 12-13/32'' D.
Dimensions: 11 15/32" W x 4 19/32" H x 12 13/32" D "